Forced into retirement by Brotherhood pressure, renowned left-wing Egyptian journalist Hani Shukrallah discusses the government’s project to control the media. In November 2010, veteran left-wing journalist Hani Shukrallah helped found Al Ahram Online, a news site that would tell the story of Egypt’s coming revolution to hundreds of thousands of readers in the English-speaking world. Since the ouster of the Mubarak regime, which had removed Shukrallah from his post at Al Ahram’s print edition in 2005 for his critical commentary, he has been forced to relive the past. This January, Shukrallah received a call from Al Ahram’s new chairman, who had just been installed by the ruling Muslim Brotherhood. With only a vague justification, the chairman told him that he must retire. Just over two years since the anniversary of the transformative events that promised to usher in a new Egypt, Shukrallah has arrived at the depressing conclusion that the vise of media repression has not loosened at all since Mubarak’s departure. Under President Mohamed Morsi, the Brotherhood-led government has employed a combination of legal tricks and street-level vigilantism to impose its will on the country’s media. I spoke to Shukrallah in February, just after I returned to the United States from an extended visit to Cairo. Over the course of several weeks in the city, I saw the conflict between the Brotherhood and its urban-based opposition turn violent, first in December, with a massive street clash near the Presidential Palace that began when Brotherhood supporters bused in from the countryside assaulted young protesters encamped outside the palace, which ended with hundreds injured and a handful dead. Following a wave of attacks days later on Brotherhood offices around the country, a group of Salafists held a sit-in outside Media City, an area outside Cairo that is home to many of Egypt’s private broadcasting outlets. There, the Islamists called for the “purification” of the media, accusing the networks of inciting violence against Morsi and attacking journalists in retaliation. During our hour-long conversation, Shukrallah detailed the Brotherhood’s employment of an “E-militia” to intimidate critics on social media, emphasizing that it sought to gradually replace the country’s professional media with a cadre of sycophants not unlike the kind favored by Mubarak’s National Democratic Party (NDP) machine. We also discussed the role of the powerful Egyptian Supreme Council of the Armed Forces (SCAF) and the Obama administration in bolstering the status quo. Finally, Shukrallah elaborated on a long column he recently published that addressed what he saw as the critical mistakes of the revolutionary youth who ousted Mubarak but who had proven unable to generate a coherent political strategy or unified leadership in his wake. MB: You were told to retire by Al Ahram’s new management, but I see you are still writing for the paper. What is your current status? Hani Shukrallah: Look, they retired me. I’m 62 and they took a decision that everyone at the paper over the age of 60 would be retired. The thing is, I belonged to a murky gray area in this. I’m the only chief editor that was retired, and chief editors—the required age [for retirement] is 65. So basically they retired me three years before the legal age of retirement for editor-in-chief. The decision was not particularly against me; it was an overall decision. But my view of it is that it was not innocent. It’s kind of clearing the deck for the new chairman to bring his own people there.… I asked for the appointment of my managing editor as chief editor in my place, because if they bring someone from outside they will just destroy the whole operation. My second demand was to clarify my own status. So far it’s been a month and I don’t know what will happen and [the chairman] hasn’t made a decision on who will take over Al Ahram Online. So I’m working and nothing has happened yet. Why are you convinced that this was a politically motivated decision? The government likes to have loyal people. They like sycophants. So I’ve never been liked in Al Ahram, and on occasion it reaches a point where they feel like they can do without my usefulness. I’m not that surprised with the latest decision. We try to keep Al Ahram Online as balanced as possible and report both sides. Our attitude is to first tell the truth as we see it, and definitely there is a bit of overall editorializing that definitely feels the principles of the revolution are something precious to hold on to: We like democracy and we don’t like torture and killing people in the streets. Definitely we are on the side of the revolution. And then there are my own editorials, and I say what I feel and I don’t really pull my punches. Definitely in the past month the brotherhood has deployed their E-militia, which has put me in their sites. I have received huge harangues and attacks. This is the way they try to malign you; they fabricate stories about you. On one occasion they accused me of being a supporter of the Algerian junta against the Islamists, which was so stupid—my position was just the opposite. Can you explain what the Brotherhood’s “E-militia” is? We do know that they are hired personnel and their job is something like MEMRI (the pro-Israel Middle East Media Research Institute) in the US. Their job is to monitor those the Brotherhood sees as their opponents, especially writers and journalists. Then they attack them with warnings, threats, slander, harangues. They are widely known in the social media world as the “E-militia.” That’s different from the Brotherhood’s street militia. During the day in Tahrir Square when they attacked demonstrators with knives and guns, they were saying there were no [Brotherhood supporters] in the square, but at the end of the day they claimed seventy Brothers were injured in the square. It was amazing when I tried to get [vice chairman of the Brotherhood-created Freedom and Justice Party] Essam El Erian to address this. He said the Brotherhood’s legal committee was investigating. I said isn’t this the job of the police, not the legal committee of the Brotherhood? I mean, where does the state begin and the Brotherhood end? And the attacks on me were amazing. El Erian was a fellow student of mine at Cairo University, and I said I don’t need to kiss his hand. [Brotherhood members] went in a frenzy of attacks and said we do kiss his hand and we also kiss his feet. The attacks are worse on women bloggers—horrible, horrible attacks. They are accused of being sluts and all that. Is this what you described as part of a wider trend of government intimidation of critical media? Definitely. They are extremely intolerant of freedom of expression. This was their attitude toward state media. They have taken state TV and radio over, and if you read our daily now, Mubarak has been replaced by Morsi. The same kind of poor, unethical, sycophantic journalism. Just change the name of the president and it’s the same kind of reporting they did when Mubarak was still around. And it’s like this throughout state media. They have also shut up some top writers. Some major columnists at [the Egyptian daily] Al Akhbar were prevented from writing. Among the people at Al Ahram forced into retirement were central people at the Ahram Center for Strategic Studies, which was always critical of the regime before and continue to be now. Inside the state-owned media you have a lot of people who are unhappy with what is going on, but I have no idea how big it is. The state media is built on servility and poor standards of reporting. But the crisis is still there. In the Arabic edition of Al Ahram, the chairman also removed the chief editor a few months ago. But the real crisis is with the private media. They are pressing very hard on the private media, from the Salafist siege of Media City to the charges against Bassem Youssef. It’s all part of the bigger picture: declaring curfew and emergency law in [the restive Egyptian canal city of] Port Said and the whole city goes out in the streets and they can’t impose it. Obviously their project is an authoritarian one, but they are not able to implement it. They keep pushing and retreating and pushing and retreating all the time. You recently wrote a long column criticizing the revolutionary youth who were behind the January 25th movement that toppled Mubarak, claiming their revolution had been “hijacked.” Why, as a supporter of the revolution, do you feel compelled to criticize them now? I wasn’t so much critical because I know they were not prepared for this moment politically. They had no experience for a thing that I could have never dreamed of before. So I can’t fault people who are much younger for a lack of preparedness. But the real purpose of looking back is that I felt that two years down the line, you have to learn from your mistakes, even if they were inevitable at the time, and start drawing the appropriate lessons. You still have a revolution with no leadership, and we are now two years in. That’s a little bit too much. It’s understandable in the first eighteen days, or theoretically you could have done something different, but at this point it’s too much. You have the National Salvation Front [the umbrella group leading the political opposition to Morsi], which really does not appeal to the people. They are too remote, too elitist. So really you needed a leadership from the young generation and it has not come yet. I spent my last night in Cairo under a cloud of teargas at the Qasr al-Nil Bridge with the crowds of guys clashing with police. It was an ongoing thing that had lasted for days and seemed to be going nowhere. It was obvious to me that the Muslim Brotherhood’s media apparatus was exploiting the specter of Black Bloc protesters as a scapegoat for the chaos gripping the country, but at the same time, I sensed that these protests, at least in Cairo, were growing directionless, and that a nihilistic attitude was developing among the youth. Were my impressions incorrect? Now we have a generation of youth who are simply tired of being killed. My own son, who is not pro-violence or anything, during the past two years there were at least four occasions when he was up all night and I know the shooting is happening and I get up and try to locate him and I find him—and he’s down at the morgue! So when you have a generation where their friends are getting killed beside them, or losing their eyes, or getting maimed, and you have a revolution with no clear direction or leadership, that is unable to impose a set discipline as it did in the eighteen days, all of this has to begin an unraveling. They have this saying now among the young people: “If you are hitting us, we will hit back.” And they do. For them, peaceful resistance has become something to ridicule. On the other hand, it seems that the opposition has managed to discredit the Brotherhood faster than anyone expected. The Brotherhood has been undermined in stunning ways! I had never dreamed of seeing this—it’s more surprising than the overthrow of Mubarak. You’d have tens of thousands across the country shouting, “Down with the Brotherhood! Down with Morsi!” Effectively they’ve lost the majority of the cities, but they still have a huge organization that is made up of several hundred thousand people. This is not Mubarak’s NDP, a flabby patronage network; these are doctrinaire believers, and they have the countryside, which has stayed out of the revolution. The countryside continues to be a reserve for whoever is in power because it is outside the revolutionary frame and it votes on patronage, on those who have access to the state and can help them in an immediate sense, including by getting their son a job. Where does the army [SCAF] fit into this scenario? It seems to me they are playing a long game and are eager to work with the Brotherhood as long as it suits their interests. The situation now is that the army is as strong as it ever was. Morsi did not remove SCAF, he colluded in their removal but they were basically getting out the old people who humiliated the second and third tier of army cadres. So this was fundamentally an internal army thing, something like an internal coup. So the army has become the junior partner in the coalition, with Morsi and the Brotherhood in the forefront. But they still have their own agenda. For now they have shared interests, but it’s very momentary and not long term, and we’ve had many instances where people have said if you can get rid of these two institutions, all the better. What about the Obama administration? 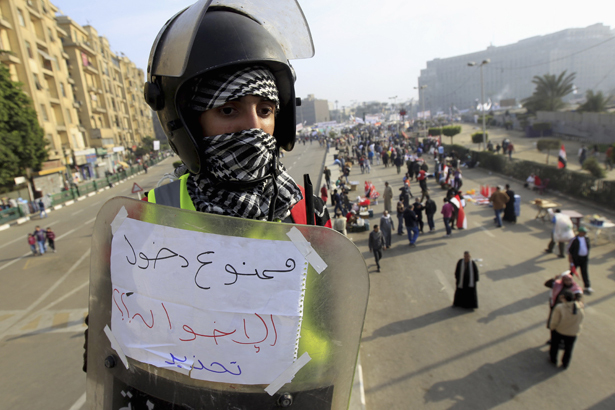 What do you make of its role in the crisis and why does it seem to be so reticent about Morsi’s repressive behavior? The US has two paramount concerns, and on these the Brotherhood has provided very well, or has seemed to provide: First, Israel. The Brotherhood is very nice on Israel if you are looking from Washington. Americans are marveling at how wonderful Morsi’s intervention in the Gaza crisis was. He proved more efficient than even Mubarak in reining in Hamas. The other thing is that when you have Pakistan and Afghanistan and Iraq, and you have the model of moderate Islamist government that actually speaks democracy and modernity and is happy to deal with the West in the same way and speak up for US-Egypt ties and friendship with Europe and keep the peace with Israel, from Washington’s point of view, that’s a goldmine. And that makes it much more difficult for the US to actually be firm with the Brotherhood, because they have a huge stake in this model succeeding. Is the Obama administration’s “all options on the table” saber rattling with Iran a bluff? Read Robert Dreyfuss’s analysis.